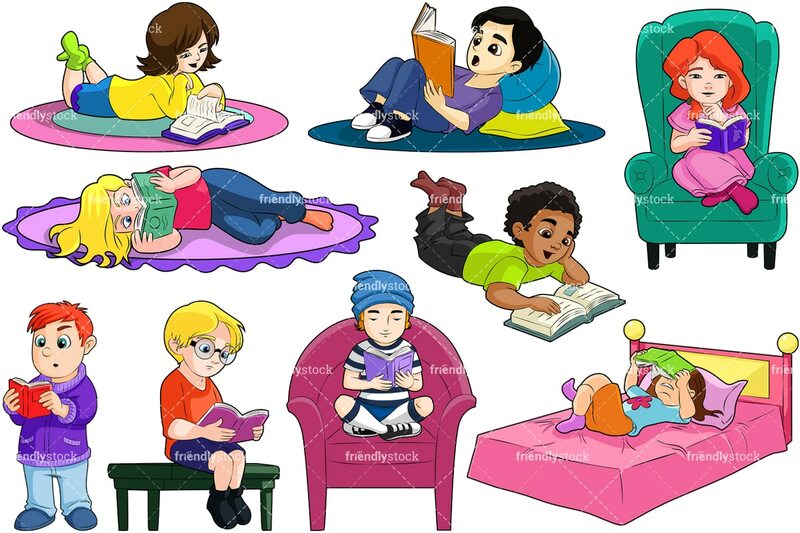 Royalty-free stock illustration of a young girl reading a book while relaxing on a rug. Her feet are kicked up and she looks as if she’s lost in the story. 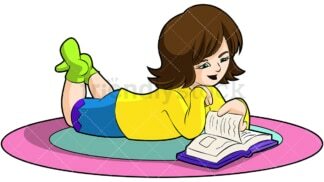 Royalty-free stock illustration of a young blonde girl lying on the ground curled up reading a good book wearing sweatpants, socks, and a long-sleeved shirt. Royalty-free stock illustration of a little brown-haired girl reading in bed while relaxing. She’s got one leg crossed and looks lost in the story. 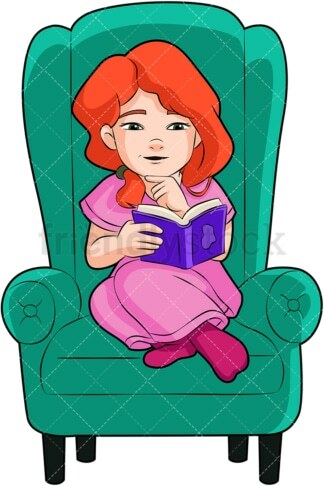 Royalty-free stock illustration of a red-haired girl in a pink dress curling up in a comfy green chair holding a book. She’s glancing off into the distance, lost in thought. 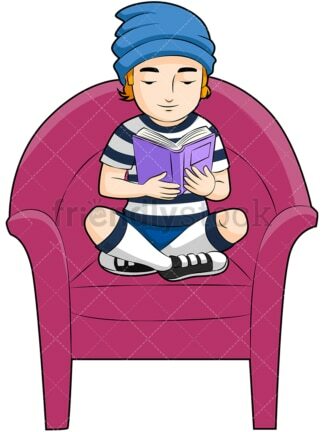 Royalty-free stock illustration of a young boy in a blue cap reading a good book on a large chair, wearing knee socks and sneakers. Royalty-free stock illustration of a young black boy relaxing on the floor with a school book. He’s got a big smile and it looks like he’s enjoying his studies. 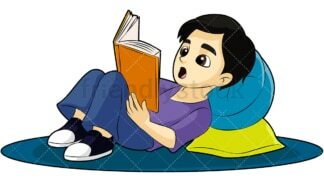 Royalty-free stock illustration of a little boy holding a book while lying on the floor, looking surprised. His head is propped up by a pillow as he relaxes on a rug. Royalty-free stock illustration of a little blonde boy with glasses sitting on a bench reading a book. The bench is hard and the boy doesn’t look happy. Could he be on a time-out? Royalty-free stock illustration of a young boy with red hair holding a book with both hands, looking surprised. He’s dressed in a warm sweater jacket and standing up as if outside in the cold!